Recruited as a quarterback, Barney was shifted to cornerback and intercepted 26 passes in three college seasons and received All-Southwestern Conference honors after each. Although relatively unknown coming out of a small college, he was chosen by the Lions in the second round of the 1967 NFL draft and moved directly into the starting lineup with outstanding results. Barney co-led the NFL with 10 interceptions, three of which he returned for touchdowns, and also handled the team’s punting. He received second-team All-NFL honors from the NEA and New York Daily News, was named to the Pro Bowl, and was NFL Defensive Rookie of the Year as chosen by the Associated Press. Barney followed up in 1968 by intercepting another 7 passes and garnering consensus first-team All-NFL recognition in addition to a second Pro Bowl selection. Physical as well as fast, he was an instinctive ball hawk and excellent in man-to-man coverage. Lions went 9-4-1 to finish second in the Central Division of the NFL Western Conference while ranking second in the league in fewest yards (3084) and fewest points (188) allowed. A contract dispute followed by an ankle injury led to a lesser performance in 1970, and while Barney still intercepted 7 passes, his tendency to gamble for the big play caused him to get burned often as well. 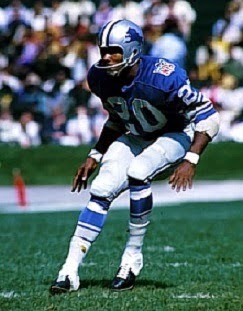 He came back to regain Pro Bowl stature four more times in a career that lasted until 1977, all with the Lions. Overall, Barney intercepted 56 passes, seven of which were returned for touchdowns, and he also averaged 9.2 yards on 143 punt returns and 25.5 yards running back 50 kickoffs. Used less as a punter, he had a 35.5-yard average on 113 kicks. Barney had 11 TDs in all, a testament to his big-play ability, and five of them came on plays that covered over 50 yards. He was a consensus first-team All-Pro twice, received at least second-team recognition on three other occasions, and was named to the Pro Bowl seven times. Barney was inducted into the Pro Football Hall of Fame, Class of 1992.